Photo: Annette Brown/The CW — © 2014 The CW Network, LLC. All rights reserved. The Vampire Diaries is getting ready to wrap its run after eight seasons, and fans are wondering if Nina Dobrev will return for the finale in March. It has been teased since her departure at the end of season six that fans will see Elena Gilbert again before the series ended. There will also trouble between Stefan and Caroline. Fans will see some sad moments for the couple during the second half of season eight. Are you sad to see The Vampire Diaries end? Do you want Nina Dobrev back for the finale? Tell us what you think. 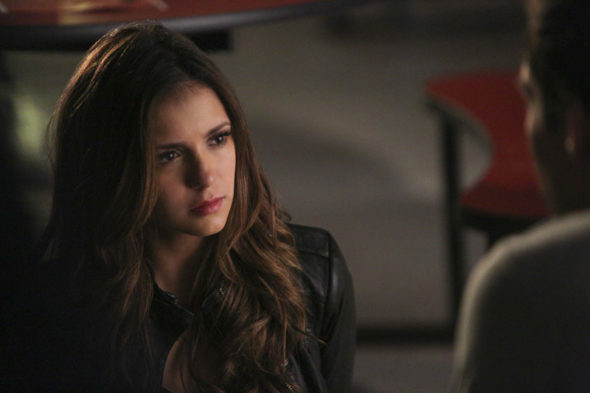 The Vampire Diaries: Will Nina Dobrev Return for Season Eight? She’ll be back, it’ll be in her contract. Otherwise they Story will be left wide open. That would be pretty unforgivable to fans for to break her promise now. No movie or problems with an ex is more important than finishing the end of a 8 season story. What if Michelle Gellar hadn’t ended Buffy? I’ll be devastated if she doesn’t return. Love Nina in tvd!!!! REALLY want to see her again!!! Why should every good thing end?? This show has been a favorite, constantly. Sure Nina captured the audience originally but Ian has carried it since. Give him a new love and watch this show soar. Really wish this wasn’t true! NO WAY should Nina be allowed to return!! She is the main reason that the show was cancelled….so NO WE DO NOT WANT TO SEE HER AGAIN!!!! Yes I am extremely sad that the ride (TVD’s) is almost over. I’m kinda hoping a few characters show up on The Originals either from time to time or maybe one or two join the show. I am thankful you Julie Plec fo 2 wonderful shows.